That’s a song we all know, but what does it mean? Why do we lift high the Cross? 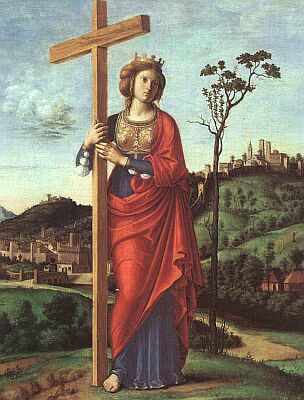 Tomorrow is the feast of the Triumph of the Cross, also called the Exaltation of the Cross. Did you know that we celebrate this feast tomorrow? The word “exaltation” comes from the Latin exaltatio, which means “to elevate” or “to lift high.” But this same word is sometimes translated as “triumph”, as in “leap for joy”, and that’s why there are two names for the feast. I find it remarkable because it means that there is something about tomorrow that has to do with lifting high, but also with leaping for joy. But let’s go back to our initial question: Why “leap for joy” about the Cross? Isn’t that a bit morbid? Yes, we honour the Cross because that’s a way of honouring Jesus. But if my dad was stabbed to death, would I honour him by wearing a knife around my neck? Probably not. But I do wear a cross around my neck. And in our house, in every room, there is a cross or crucifix hanging on the wall. And we make the sign of the cross – indeed, every prayer we say begins and ends with the sign of the cross. Our faith teaches that it’s good to have representations, because when we honour the image, we are honouring the person the image represents. We don’t worship the image. There’s a difference between true adoration (which we give only to God), and veneration or honouring (which we can give to images). If I honour my parents or others I respect, it doesn’t mean that I am worshiping them. So we worship Jesus, but we venerate the Cross. That’s one of the things I love about the Good Friday liturgy: We line up and come up to the front, and there’s a large cross that we are invited to venerate. Some people bow, some people touch it, some people even kiss it. This is something that has always moved me. Why do I come up and kiss the wood of the cross? Well, because without the Cross, there would be no Church. Without the Cross there would be no Christianity. Without the Cross there would be no Resurrection. Without the cross there is no freedom and no salvation.